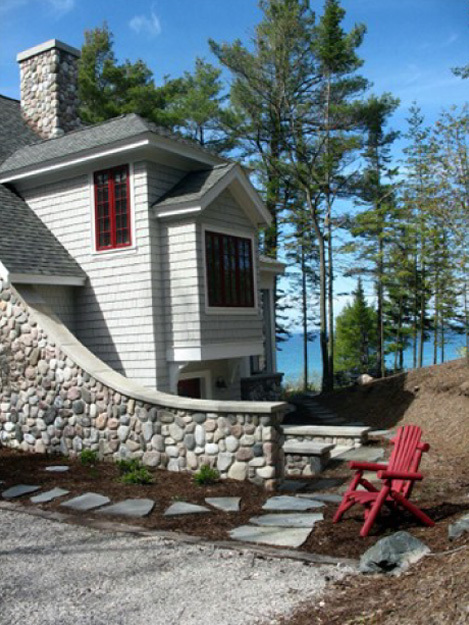 Biggs Construction builds fine, custom homes throughout the Northern Michigan area. We also do extensive remodeling, additions, upgrades and repairs of all types. Unlike many builders who subcontract much of their work from out of the area, we are here for you after your home is completed; we are your neighbors and our name is on every job we do. We work with only the best contractors in this area. They are members of your community, and, as a group, we are proud to be an anchor for the Leelanau County economy. We invite you to browse our site, look at the work we’ve done for others and discover what makes a home built by Biggs Construction more than just a home. ...when you hire Bob Biggs, you not only get the finest contractor, you get a life-long friend. If, however, you expect him to play golf with you - forget it! What really impressed me about this house was that it was totally built by fine cabinet makers! Bob and his team worked with our architect to make all of the details special. Many of the best ideas came from Biggs' finish carpenters. The quality of the job really shows up over time. After eight years our house is as tight and maintenance-free as it was the day we moved in. We would like to thank you for the fine work your crews have done for us. In addition to providing good workmanship, they seem to be really nice individuals, polite and pleasant. I'm sure you are proud of them.... We look forward to a continuing relationship with Biggs Construction. - David N. Hendricks, Pres. Walker Tool & Die Co.